Well, you have to be thankful that life works out predictable in this highly volatile environment and economic situation - we still have work to keep us occupied, salary gets in as usual, there's enough moolah to cover all the bills, the kids (and I) are growing and healthy, my husband and I are still married though we live separately most of the time, and well, that's how life goes. BUT. Deep, deep down inside, I am feeling pretty restless at the absence of excitement in life. When MBA mission is over and accomplished, for a while I felt hugely satisfied and inspired that I had overcome one major block in life - that is to graduate with a master's degree. I guess I'm an adrenaline junkie, somewhat. Even though I've settled down with two kids, I am always on the lookout for something to set my eyes on, to pursue and conquer at the end of the day. 1. 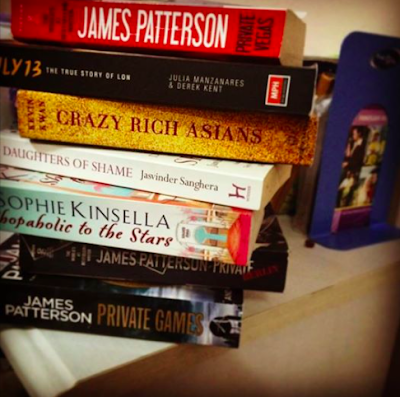 To read and finish a book every month (12months x 1 book = 12 books all together) - checked! 3. To go on an overseas trip - does Brunei count?? It's still on the same land though, but hey, our kids got their first Immigration stamp on their passport! Although I spent 4 years going back to school and doing lots of reading, it's not the same, no sir! Reading because you are obliged to, as opposed to reading because you enjoy reading can feel somewhat 'empty' (just like performing solat because it's compulsory but you don't put your heart into it will make you will feel 'empty'). So when I graduated, I thought it was time to catch up on my first hobby - reading. So I read. And read one book after another. I don't have a specific genre that I like to read - my choice of book depends on the author. I tend to buy books by the same author because I would feel a lot more confident that I will like their writing style hence their storyline. I also like straightforward books - one that doesn't require me to go on overdrive mode trying to understand the message the author is trying to deliver. After all, I read books to unwind and I like to unwind in the most relaxing manner, LOL. So if you are thinking to get me books for birthday gifts, skip Dan Brown or Stephen Kings, please. So far, my favourite authors are Sophie Kinsella (I get amused by her characters), James Patterson (he writes murders and crimes in the simplest manner and language), JK Rowling (who doesn't like her books? ), Diana Wynne Jones (I'm not embarrassed to admit I still read children's fictions, but I love love LOVE her imagination!) and Kamila Shamsie (she is just amazing at describing simple, every day things). So yes, this is one big accomplishment this year! On the second goal - there is one good news and one bad news. 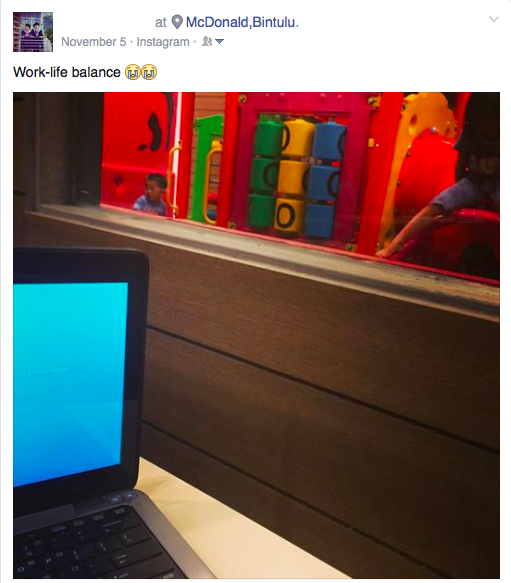 The bad news is, being workaholic is pretty tough to kick out! I thought I had cured myself of this addiction after Khayla was born, but then I relapsed. To make it worse, I realize that I tend to get more productive towards the end of the day rather than at the beginning of the day. So when I go into productive mode, it's already 5pm. Most of the time, I end up calling my mom to ask her to pick the girls up and continue my work until 6.30 or 7pm. The good news is, I think I'm slowly starting to let go of this bad habit. It's just taking quite some time to convince myself to leave office while the sun is still up (yeah, 3 years is pretty much a long time to change!). I was a lot worse back then - when I started work, my record of going back from the office was 4 freaking AM! Then I started to cut back to 10pm, 8pm, 7pm.. and now, trying to go back earlier than 6.30pm. I've also stopped regularly bringing work home, since I know that I'll go into mommy mode, so there's no way I'll touch my work laptop once I reach home (unless I have a really, really urgent deadline!). So, yeah. I'm still on track on this one! Still, I am determined to make it happen. I don't agree with people who say that it's a waste of time and money travelling when our kids are still young because we have to lug around a lot of stuff (diapers, strollers, formula milk, etc.) and they will most likely end up not remembering the trip. Instead, my rationale is it will be more difficult to go on vacation during off-peak period (read: when it's not school holiday) once Khayla started primary school. Besides, kids' tickets are cheaper and most of the time, admission fees for kids are half of adult's price when they are not of school-age (6 years and below). Below 4 are even free! So, I lowered my expectations (read: divert my attention away from Europe / Australia) since currency exchange is pretty bad now, and instead will take the opportunity to visit my sister in Japan during winter. At least we will save a lot on plane tickets / travelling time there. With that, I am looking forward to 2016. 2015 may be monotonous, but it's good monotonous. I hope to stir things up in 2016 but I haven't figured out in what way LOL! Perhaps Japan will give me some ideas on what to do in 2016. Will definitely blog about my Japan trip later. Toodles!